Can't remove leftovers from uninstalled application. About a year ago I installed National Instrument's LabView, but uninstalled it soon afterwards. I became aware that there are leftovers, presumably in the registry. Insert the 'NI Data Socket 5.0'disk and click OK. Using XP's Search for National Instruments reveals nothing. However, if I run JV16 Power Tools' Software Uninstaller, it coughs up well over 100 entires, whose Author is National Instruments, in the "Installed software without uninstall info" section of the results. If JV16 can see them there must surely be a way for me to see them too? How can I locate these entries and delete them? I shall attach a text file listing the entries. The simplest way to do this is to reinstall it, then use Revo Uninstaller to uninstall it. Take the Advanced pat5h. I'll try that. But what is the Advanced pat5h? I think Ztruker meant path Syncopator. I don't see Advanced Path anywhere, can you help? I can't read the Help file either. It opens up in Notepad and reads gibberish, although the header at the top of Notepad says it's a pdf. Nope, meant exactly what I said. 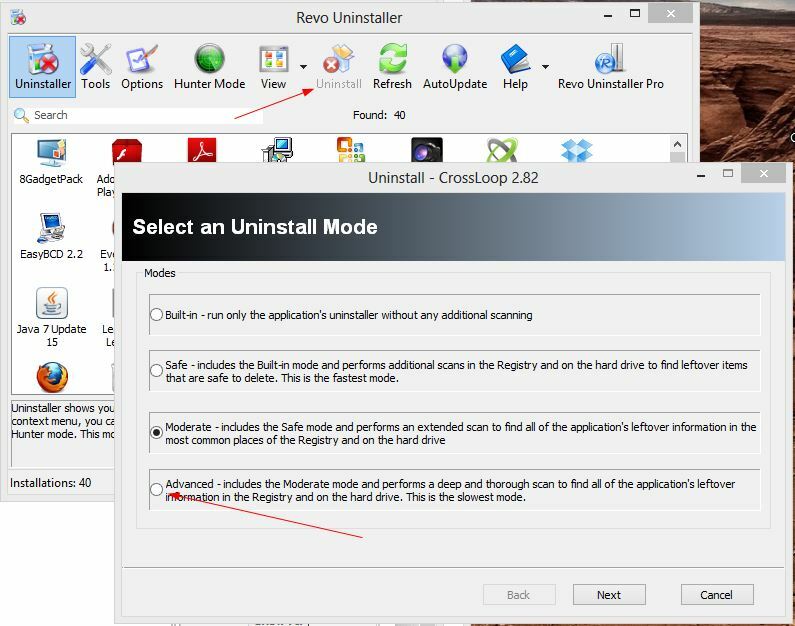 Select the program you want to remove then click uninstall. Select the Advanced Radio Button then click Next. Advanced does a more thorough job of scrubbing left over files and registry data. The first thing Revo does is create a System Restore Point, unless you disable that under Options.